Buckwheat is an annual herb, growing up to 1 m tall, hairless or young parts rarely minutely hairy. Stem is ribbed, reddish. Leaves are stalked, stalk 0.5-2 cm long. Lower leaves have long stalks, upper ones are nearly stalkless. Leaves are triangular or arrow-shaped, heart-shaped, basal lobes rounded to long-pointed, 1.5-10 x 1-8 cm. Flowers are borne in stalked many-flowered corymb-like clusters, in leaf axils and the end of branches. Flowers are pink or white, stalked. Petals are 5, ovate or oblong-ovate 3 x 2 mm. Stamens are 8, unequal, about 1.5 mm long. Ovary is 3-angled, styles 3, as long as ovary. Nuts are deeply 3-angled, angles acute, brown, smooth, narrowed at both the ends, 4-8 x 2.5-5 mm broad. 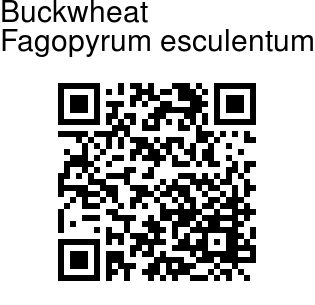 Buckwheat seed is also used for making flour. It is similar to the sunflower seed, with a single seed inside a solid outer hull. Flowering: May-September. 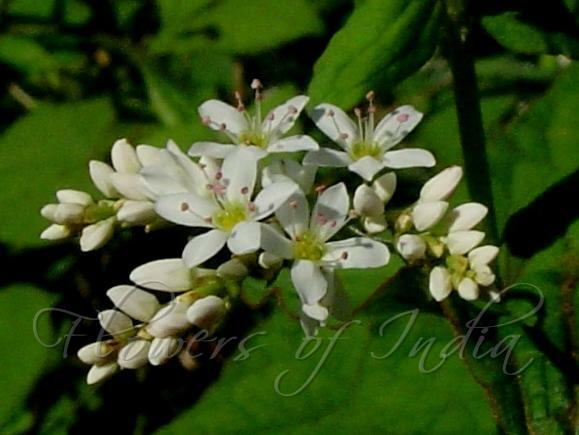 Medicinal uses: Used to treat high blood pressure associated with fragile capillaries, and for frostbite, chilblains, retinal haemorrhages, and radiation damage. In Chinese medicine, it is prescribed for traumatic injuries, lumbago, period pains, bites, and stings. Identification credit: Navendu Pāgé, Prashant Awale Photographed in Mizoram & Manipur.